We’d love your help. Let us know what’s wrong with this preview of What a Writer Needs by Ralph Fletcher. The work of Donald Graves, Lucy Calkins, Donald Murray, Nancie Atwell, and others has led to a whole generation of writing process workshops where children write, share, revise, and publish their work with confidence. But such progress raises problems, and teachers today have a number of new concerns, mainly: Now that my students are writing, how do I help them improve? "W The work of Donald Graves, Lucy Calkins, Donald Murray, Nancie Atwell, and others has led to a whole generation of writing process workshops where children write, share, revise, and publish their work with confidence. But such progress raises problems, and teachers today have a number of new concerns, mainly: Now that my students are writing, how do I help them improve? 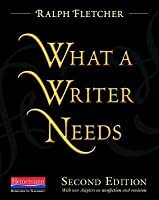 "What a Writer Needs" answers these concerns. In engaging, anecdotal prose, Ralph Fletcher provides a wealth of specific, practical strategies for challenging and extending student writing. There are chapters on details, the use of time, voice, character, beginnings and endings, among others. The work of student and professional writers is sprinkled throughout the book, and a generous appendix of useful picture books and novels is also provided. To ask other readers questions about What a Writer Needs, please sign up. I am participating in a National Writing Project workshop from late June through mid July. Our first reading assignment has been Ralph Fletcher's What a Writer Needs. My initial reaction is that Fletcher does not necessarily distinguish teacher from student when he discusses writing. True, he provides many examples of work generated by students of all ages. This underscores the immutable reality that we are all writers and should view ourselves as such. There are few writing exercises to be found I am participating in a National Writing Project workshop from late June through mid July. Our first reading assignment has been Ralph Fletcher's What a Writer Needs. My initial reaction is that Fletcher does not necessarily distinguish teacher from student when he discusses writing. True, he provides many examples of work generated by students of all ages. This underscores the immutable reality that we are all writers and should view ourselves as such. There are few writing exercises to be found here. That is not Fletcher's way. What a Writer Needs promotes the concept that as a teacher of writers we need to be both guide who knows when to get out of the way, as well as an active and vital participant in the writing process. With guided encouragement, we are to help ourselves and our students write about the things and ideas which they truly care about. Most students write far far better than they will ever know. We have to let children in on the secret of how powerfully they write. We need to let them take inspiration from they already do well. Fletcher devotes several chapters to some of the better known tools of the craft: character, voice, beginnings and endings, tension, and language. I appreciate that Fletcher handles each of these less like a nuts and bolt chapter on what is right and wrong but more true to his overall message and tone of encouragement. We can learn how to tease these things out of our students, but only if they can see and hear their classmates successfully use them. Yes, you can use examples from literature, but the real sell on a soul is when one experiences the concepts and realizes that they truly are accessible. As an aside, some of the most powerful messages delivered by Fletcher were the student samples included in his book--especially those from younger grades. It is natural for an English teacher to look at a piece of writing and think about how he/she would assess it...what comments we could have made. Fletcher does not get into assessment or grading, and that is ok. This isn't that book. Additionally, there is an undertow in this text--stop setting kids up to please you. Stop asking for writing which earns your smile or disdain. Who we are and what we say and how we go about each affects students and their writing far beyond what we know. I like that Fletcher uses and promotes the use of the word "mentor". Actually a prominent chapter of the book is on the role and good use of a mentor. I anticipate that a core element of the NWP experience will include mentoring. This word is changing the way I view my role in the class--there is indeed a different spirit to the word "mentor" as opposed to the word "teacher". It is ok to be a mentor. It is ok to open your love of language, story-telling, and books to the students. While I see many similarities between the role of mentor and teacher, Fletcher categorization of our roles seem to blur as the same as what we expect of ourselves as teachers: high standards, build on strengths, value originality and diversity, encourage risk-taking, passion, and look at the big picture. The difference lies in the willingness to coach or guide--and I firmly believe that while all coaches are educators, not all educators have it in them to coach. Coaches can reach kids in ways that a teacher may not. That sounds harsh and perhaps critical, yet that is not the spirit or my intention. With the right coach or teacher, the person becomes bigger than the text. A teacher or coach can be like a mountain--the closer your get to them, the bigger they seem. They care more about the name in the grade book (or on the jersey) than the letter/score in the grade book. I think this can be a challenging transition of mind for some. I wrestle with it as I write this and as I read Fletcher's thoughts. I would never not consider myself a teacher, but I'm beginning to interpret what Fletcher means when he calls for us to mentor. My gosh, it is ok for me to write with my students...and share it? Isn't that a little self-absorbed? Isn't that risky? Additionally, I struggled with the concept that it is more important to make time available for students to write, and I supposed that will be the greatest challenge for me. How can I find or make time? Where can I snip free some of the elements of my teaching which would allow for significant blocks of time for writing? It is time for an overhaul of how I look at writing and have been trained to look at writing. I applied to the NWP because after 16 years of teaching and experiencing many new initiatives, curriculum changes, philosophies, and adjustments because of law or nuance, I wanted a fresh perspective. I see this as an opportunity to step back and open my eyes and ears and overhaul what I do and why I do. Inspiring. This book is like a writing teacher's muse. It didn't tell me HOW to teach writing, it just gave me insight into what my writers need. It took a different perspective than most; instead of giving it directly, he uses examples of student writing and talk. Murray provides an alternate way of looking at the teaching of writing. Rather than fill his book with exercises and rules, he lists what he believes to be the essential pieces of each writer's life, touching most frequently and powerfully on the power of agency for a young writer. This is a must-read for anyone interested in writing or the teaching of writing. This workshop classic from the early 90s works on two levels. You can read it as a wannabe writer and you can read it as a wannabe-better writing workshop teacher. Fletcher, you see, has credentials not just as a teacher but as a writer as well. Unlike some writers of teaching books, he has also published books of poetry, children's picture books, magazine fiction, and essays. What's more, his own work is sprinkled liberally throughout this book. That, combined with generous portions of student This workshop classic from the early 90s works on two levels. You can read it as a wannabe writer and you can read it as a wannabe-better writing workshop teacher. Fletcher, you see, has credentials not just as a teacher but as a writer as well. Unlike some writers of teaching books, he has also published books of poetry, children's picture books, magazine fiction, and essays. What's more, his own work is sprinkled liberally throughout this book. That, combined with generous portions of student works (aged K to 8), serves as exemplars for his points. In some ways this is a good soup-to-nuts book for teaching writing. If there's an Achille's heel, it is that it focuses way more on fiction/memoir writing than essay writing (a weakness prevalent in many books of this sort). Of course, it's been argued that writing narrative from your own experience is essential in student writing, and I do not disagree. Still, it'd be great to see more methods and strategies for non-fiction pieces too. Fletcher does not ignore it; he just gives it short shrift. Chapters of note in the book are those devoted to the craft of writing: The Art of Specificity, Creating a Character, Voice, Beginnings, Endings, Tension, A Sense of Place, A Playfulness with Time, Unforgettable Language, and A Significant Subject. The appendix, which includes many books to use in teaching, is helpful but, as you might expect, a tad dated. I've read this before and I love his approach to writing. I especially love how he recognizes that all aspects of writing tie in together and are hard to separate. He allows for most types of writers from over involved to totally uninterested. He makes it possible for any student to not only succeed but also to love the craft. I want to be like this guy when I grow up. Summary-Steps of the writing process and how to become a better writer. No one but Ralph can put the complexities of writing into such beautiful, accessible prose. It's hard to believe it, but this is a professional read that I had a hard time putting down. He lives his work - and it shows. Every one of his own examples and every one of the student examples fits perfectly into this book. I'm jealous of Joann Portalupi! Fletcher provides a great resource for all writers, aspiring and perspiring alike. Some of the chapters offer clear insight and strategies into how to teach writing to student while others do not. However, Fletcher's nonchalant, candid, friendly writing style makes this a pleasure to read. I'd never think of this as a "textbook" because of how enjoyable it was reading it. I love the way Ralph Fletcher helps us begin reading like a writer. The way he teaches us to be better writers, while also teaching us how to inspire students is unique and exemplary. I love his writing style. Wonderful examination of writing from a right-brain perspective--instead of setting up writing instruction as a step-by-step, fill-in-the-blank process, Fletcher examines large contexts and treats elementary student composition as seriously as the prose/poetry created by adults. Refreshing. This book was the text for a Writer's Workshop that I attended. It is geared towards teachers of writing, mostly those who have younger students. But, Fletcher has a lot of great advice and ideas for writers of all ages. My favorite part-"It doesn't matter if the writer begins cleverly, ends neatly, organizes smoothly, writes dramatically with voice. It is all meaningless unless the writer can find something interesting and important to say about the subject." Great book that allows us to see that all kids can write and let them know they can and celebrate when they do!! I liked Fletcher's insight into the different areas of writing, especially when working with kids. How to be a mentor to your students and show them how to write the different aspects of a good piece of writing. Apparently has good examples of writing craft/ mini lesson ideas with actual textual references from novels, short stories, poems ,etc. In this book, Ralph Fletcher gives us (teachers)a lot to think about in how we structure our writing time during the school day. Loved the book and keep it handy! Great book for teacher book clubs. Filled with a lot of useful information. Wishing it was broken down a little differently but overall a really good book that had a lot of information to come away from. This is an important book for writers, though it mostly parrots Don Murray, repeating information writers already know. Nevertheless, these kinds of reminders are sometimes needed. This was the first Ralph Fletcher book I read. I read this the summer of 2009. The book opened my eyes to the possibilities of teaching writing. Pretty good story about this guy's learning to like writing. Get writers to go more in depth when they write. Have them find the deeper meaning in the story. Find the 5 senses of the story. Currently reading for ECE Reading/ Language Arts course!! Helps build and create great writers (and readers)!! Fabulous book for teachers who want to help students write better. It's also good for anyone who wants hints on writing better for themselves. I give this book the best recommendation possible: I had to stop reading it a few times in order to write. Every teacher needs this book! Ralph Fletcher is a friend of young writers and readers as well as writing teachers. He has written or co-authored many books for writing teachers includng Writing Workshop: The Essential Guide, Teaching the Qualities of Writing, Lessons for the Writer's Notebook, Boy Writers: Reclaiming Their Voices, and Pyrotechnics on the Page: Playful Craft That Sparks Writing. Ralph has worked with teachers a Ralph Fletcher is a friend of young writers and readers as well as writing teachers. He has written or co-authored many books for writing teachers includng Writing Workshop: The Essential Guide, Teaching the Qualities of Writing, Lessons for the Writer's Notebook, Boy Writers: Reclaiming Their Voices, and Pyrotechnics on the Page: Playful Craft That Sparks Writing. Ralph has worked with teachers around the U.S. and abroad, helping them find wiser ways of teaching writing.